AURORA, Ill.--August 27, 2015--AAA Travel projects 35.5 million Americans will journey 50 miles or more from home during the Labor Day holiday weekend, the highest travel volume for the holiday since 2008 and a one percent increase over 2014. While the majority of travelers (30.4 million, 86 percent of all travelers) will celebrate the holiday with a final road trip before summer comes to a close, air travel is also projected to grow 1.5 percent this holiday. Over 2.6 million travelers are expected to travel by air, making this the largest volume of air travel since 2007 for this holiday period. The Labor Day holiday travel period is defined as Thursday, September 3 to Monday, September 7. In Illinois, 1.9 million people will be traveling for the holiday weekend, which is a .8 percent increase from 2014. Of those travelers, just over 1.7 million will be driving (a .7 percent increase compared with 2014) and just over 72,000 will be flying to their destination (a 3.1 percent increase from 2014). Gas prices across Illinois are on average $2.98, down significantly from $3.52 in 2014. In Indiana, just over 816,000 people are expected to travel, which is a 1.4 percent increase from 2014. Of those, 725,000 are expected to travel by auto (1.3 percent increase) and about 31,000 by air (3.8 percent increase). In Indiana, gas prices are on average $2.73 per gallon, down from $3.44 this time last year. The average price nationally for gas is $2.58. Historically, when Labor Day weekend falls later in the calendar, Americans have shown less inclination to travel. As Labor Day falls on September 7, the latest possible day it can occur, the overall travel growth potential is dampened somewhat this year. Rising wages and falling gas prices have helped boost disposable income, which has risen 3.5 percent over last year, but some consumers are using that money to save and pay debts. Automobile travel will increase by 1.1 percent this year, with 30.4 million travelers hitting the road. Nearly 7.4 percent of travelers (2.6 million) will travel by air, a 1.5 percent increase from last year. 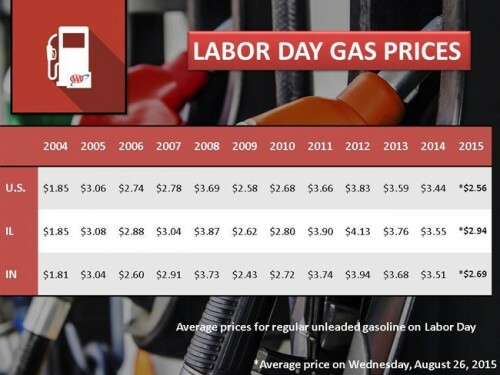 Despite recent price spikes in the Midwest gas prices, travelers continue to benefit from substantially lower prices compared to recent years. Drivers in Illinois and Indiana will pay the lowest gas prices since 2010 and 2009 respectively. The national average price for a gallon of gasoline is $2.57, $.86 cents less than the average price from a year ago; this is the lowest U.S. average since 2009. Drivers can use the AAA Mobile app to find the lowest gas prices close to home and along the way to their holiday destinations. Travelers can also plan routes and fun stops for the whole family at AAA.com using AAA’s TripTik Travel Planner; members can save and share customized routes for use on a smartphone, tablet or with the AAA Mobile app. According to AAA's Leisure Travel Index, hotel rates are expected to average higher this Labor Day holiday, while the cost of a flight is slightly lower. AAA’s projections are based on economic forecasting and research by IHS Global Insight. The Colorado-based business information provider teamed with AAA in 2009 to jointly analyze travel trends during the major holidays. AAA has been reporting on holiday travel trends for more than two decades. More information including an infographic for the AAA / IHS Global Insight 2015 Labor Day Travel Forecast can be found here. AAA Three Diamond lodgings are expected to be the highest in five years, increasing 2 percent from one year ago, with travelers spending an average of $175 compared to $171. The average rate for Two Diamond properties increased 10% from Labor Day 2014. Year-to-date through August, the average rate for Two Diamond hotels has increased 9%. The $138 average is 13 dollars higher than last year, and the highest for this holiday in the past five years. Airfares are down 1 percent, with the average round-trip discounted fare for the top 40 U.S. routes costing $216, down from $219 last year. AAA Chicago is part of The Auto Club Group (ACG), the second largest AAA club in North America. ACG and its affiliates provide membership, travel, insurance and financial services offerings to approximately 9 million members across eleven states and two U.S. territories including Florida, Georgia, Iowa, Michigan, Nebraska, North Dakota, Tennessee, Wisconsin, Puerto Rico and the U.S. Virgin Islands; most of Illinois and Minnesota; and a portion of Indiana. ACG belongs to the national AAA federation with more than 55 million members in the United States and Canada and whose mission includes protecting and advancing freedom of mobility and improving traffic safety.